I am a freelance musician, playing flute, alto flute and baritone sax, as well as tenor and alto saxes. I also compose, record and produce music at home and at other studios. I have recorded or played live with various bands in the last few years, including Stone Foundation on their albums Everybody, Anyone (2018), Live Rituals (2017), and Street Rituals (2017) which was produced by Paul Weller. The track Your Balloon Is Rising - on which Weller sings the lead vocal - features some of my flute work. I have played on various tracks and appeared in videos coordinated by the London/Ramsgate artist Harry Pye. On one of these - Rio - I had the privilege of working with one of my past heroes Neil Innes, formerly of the Bonzo Dog Band. In 2010 I played one of my own compositions at Tate Modern as part of the presentation by Team Beswick and Pye. In the 1990's I arranged and recorded the brass section for KWS on their 1992 dance floor hits Rock Your Baby and Hold Back The Night (with The Trammps). Formerly I was a member of the infamous Birmingham band Dexys Midnight Runners and played on the album Too-Rye-Ay (1982) as well as the singles from it: Come On Eileen, Jackie Wilson Said and The Celtic Soul Brothers. 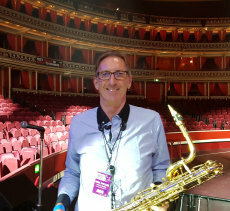 Later on I played on much of the Elvis Costello album Punch The Clock (1983) as one of the TKO Horns, and toured with him in the USA, Europe and the UK. I have worked as a session musician for various artists throughout my professional life. I was particularly proud to play on the influential protest song Nelson Mandela (1984) by The Special AKA. For a number of years I worked in the further education sector as a lecturer and course leader in music, music technology and radio production at various colleges. I currently play in a modern big band and a contemporary jazz octet, and as time allows am working on a solo project which has influences from electronic, jazz and classical music.